Morrison Construction has created a new virtual reality (VR) induction as a way to improve site safety, following a £50,000 investment. The induction, developed in partnership with the University of the West of Scotland with the expertise of 3D animation specialist Animmersion, was unveiled at the Construction Scotland Innovation Centre in Blantyre yesterday. It took eight months to develop a realistic experience for induction participants, with the site and construction teams from the Morrison Construction Scottish Water business involved in the process. The induction, set in a computer-generated imagery (CGI) construction site, allows users to immerse themselves in the animated environment as they navigate their way through three modules using goggles and hand controllers. The modules allow users to become familiar with a construction site, recognise common dangers and complete a simple activity on site, while emphasising the importance of correct safety procedures. Participants are required to mark key site dangers, such as buried services, with red flags, receiving a mark on the completion of the second module. An interactive task in the third module is set on a site where underground services works are taking place to demonstrate the consequences of not being aware of safety risks. 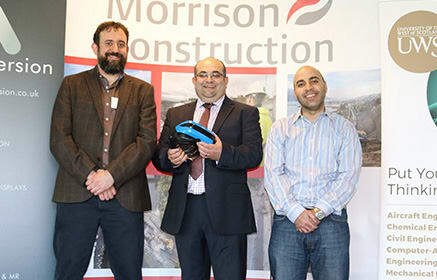 University of the West of Scotland senior lecturer in construction engineering, Mohamed Abdel-Wahab, said: “It is great to see Morrison Construction launching this innovative VR induction. VR application in the construction industry provides an effective means for health and safety training. It helps to raise awareness of on-site hazards and ensure compliance with HSE guidelines, thereby reducing the likelihood of on-site incidents.